“Deco Diva” is the stunning story of a woman who lived life on her own terms. It’s 1939, it’s Paris and Tamara is preparing to leave for America to escape the threat of war in Europe. The occasion causes her to reminisce about her early life in Poland, her days of living in total luxury in Russia with Aunt Stefa, her marriage to handsome Tadeusz Lempicki, her escape during the Russian revolution and her self-discovery of her passion for art and love. In one act, we get to see this remarkable artist recreate herself from a privileged young girl into an international, glamorous, talented, bisexual icon of the Art Deco era. Philadelphia, Pennsylvania – July 17, 2006 – Philadelphia native Rene Goodwin is set to star in “Deco Diva,” a one-woman, one-act play examining the life and work of glamorous, bisexual Tamara de Lempicka, a celebrated portraitist during the Art Deco era. The one-act production gives audiences a glimpse into de Lempicka’s life in 1939 Paris as she prepares to leave for America to escape the threat of war in Europe. Goodwin portrays de Lempicka, the daughter of a Russian Jewish father and Polish mother, as she recalls her childhood in Poland and Russia. She brings to life her daring escape during the Russian Revolution and some of the important characters in her life including her husband Tadeusz and some of the models who posed for her. She talks openly about her love of and love affairs with her models, and her discovery of her passion for art. The drama includes musical selections representing parts of de Lempicka’s life. “In a single act, this play lets us see this remarkable artist recreate herself from a privileged child into an international icon of the Art Deco era,” says Goodwin. “It is an honor to play de Lempicka -- a woman who lived life on her terms”. “Deco Diva” initially premiered in 1998 at the Edinburgh Fringe Festival. Since then, it has been performed in London, Poland, and in a three-week off-Broadway production. This is the first time an actor other than the playwright is performing the piece. Goodwin, a life-long Philadelphian, is an all-around performer working as an actor, singer/songwriter, recording artist, with two CD’s available, and a voice teacher. Married to pianist/conductor Ed Hagopian, Goodwin and Hagopian often work together as performing musical artists. As an historical interpreter, her two programs of Eleanor Roosevelt have been performed at the White House Visitors’ Center under both the Clinton and Bush administrations. Goodwin also performs a program of American writer Dorothy Parker and is developing a characterization of Golda Meir. She recently performed in “Voices” at the Walnut Street Theater and in “Jacques Brel is Alive and Well and Living in Paris” at the Adrienne. She also performed in the 2005 Philadelphia Fringe Festival. Goodwin will appear in a production of “Imaginary Friends” next winter at the Walnut Street Theater’s Studio Five. 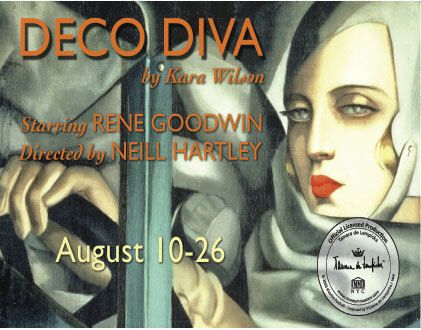 “Deco Diva,” written by Kara Wilson, opens on August 10th and runs through August 26th at the Shubin Theatre, 407 Bainbridge Street in Philadelphia. For ticket information call 215.271.5872 or e-mail renegood@comcast.net. For Information: info@gh-entertainment.com or 215.271.5872. Copyright © 2014 GH Entertainment. All Rights Reserved. Copyright © 2005 GH Entertainment. All Rights Reserved.